Denny Jump (Bellevue, WA, United States) on 3 January 2018 in Landscape & Rural. I captured this on Sunday, Jan 1 2018...which was actually the official first day of the full "wolf moon." As a consequence, the moon did not really surface above the mountains until about 15 minutes after this image was made. When the moon finally DID appear, the sky was, really starting to get darker. I, nevertheless, managed to collect a few more images..I will present one or two more shots in the coming days to display the transitions that occur. I like how you tell us the background and don't just 'show' it ! Adds a lot. @maurizio: Thank you so much Maurizio! Nonetheless a fantastic photo, Denny. I have often admired Mount Baker from Vancouver Island. There may be no moon, but the blue silhouettes are beautiful in their own right. And Mount Baker is like icing on the cake! 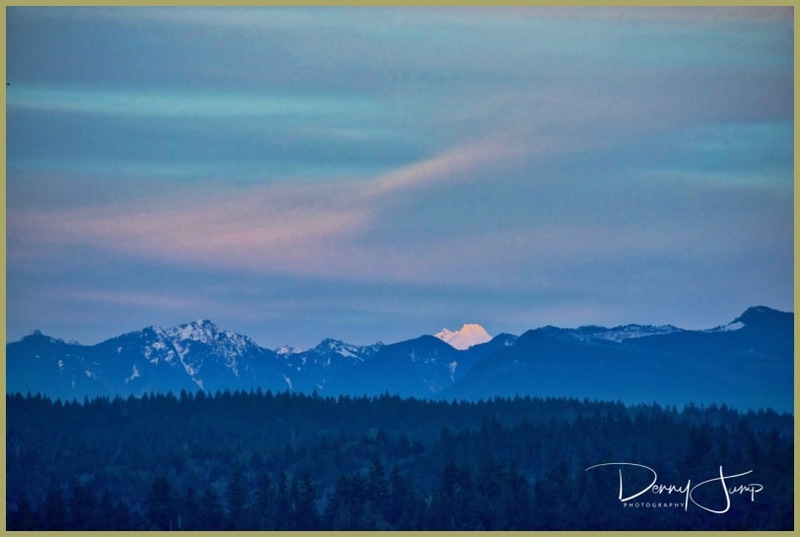 A nicely-layered composition with a beautiful view of Mount Baker!! Such a gorgeous view! I tried to get a picture of the super moon on January 1st. It did not turn out too well. I needed to be there right at sunset and I missed that. So, the sky got too dark. Hopefully I will try again next month! @Elaine Hancock: Hi Elaine! Thank you so much!! Yah the window is a tight one for sure! I miss it mire than I make it! I love that big mountain in the back. @B. Thomas: Thank you, Barbara! It is Mount Baker and it actually sits behind the 'front range" that you see here....Thanks kiddo! A beautiful image with a pleasing color in the clouds and the snows of Mt. Baker. Pretty layers, too.